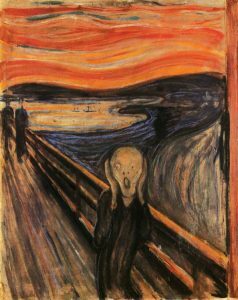 Edvard Munch’s “Scream”, painted in 1893, is one of the famous work during the modern art period, which expresses his actual experience of a scream piercing though nature. Munch’s life was full of tragedy, including his mother and older sister’s death from tuberculosis. Also, he went under poverty despite his father was a physician. Because he became alone since he was young, he isolated himself with people and he was with his artworks all the time. The Scream visualizes his abnormal state of his mind that he struggled during his lifetime. The object, nature background, is painted with bright and extreme colours, and it is liquidated into organic and linear flow, showing the characteristic of both expressionism and art nouveau style. The subject, the foreground figure is also destroyed by the destructed flow of nature. The figure is genderless and it is depersonalized so that anyone who undergoes though the suffer of unstable psychological state, including Munch himself, can related to the artwork. This artwork has been popular around the world, and it has been parodied on Social media, collage, and by other artists. Andy Warhol, a famous graphic designer and printmaker, got impressed by Munch and professed by the fact the Munch was not only a painter but he was also a printmaker. In 1984, Warhol started After Munchseries to show his respect for Munch. He took the photograph of the original work, then he enlarged it and traced with bold graphite lines on the woodblock. Then he applied various colours on the woodblock to print lithographic version of the Scream. The characteristic of expressing the distorted nature with organic and liner painting method is reflected with curvy and linear cut on the woodblock. The use of various colours are also applied in respect of the original wok and the message. Unfortunately, Andy Warhol’s After Munchseries got rejected by gallery director, so it became unknown. 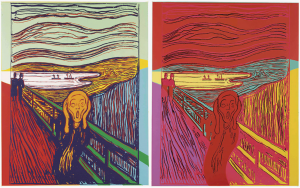 This work is displayed at MoMA now, and it deeply reflects Warhol’s respect toward Munch as printmaker. Author Luna LimPosted on June 29, 2018 Categories Uncategorized1 Comment on Hello world!